No outfit is really complete without a good pair of shoes. And fashionistas will tell you that no wardrobe is complete without a good pair of trainers. Knowing what trainers are and why you should have a pair (or two. Okay, three) will help you show off your active lifestyle and fashion sense. Trainers and running shoes are easy to confuse, as they often have similar appearances. That being said, there are considerable differences between these two shoe styles, both in form and function. So, in addition to talking about what trainers are, we will talk about their history, and differences with running shoes. Trainers have come a long way over the last century. They have gone from being simple, basic, and primitive leather or canvas shoes, to fashion must-haves and spendy collectibles. Over the last few decades, training shoes morphed from solely being athletic gear to becoming fashion footwear essentials. The first training shoes were introduced in the 1800s as “plimsolls.” These were made entirely of leather and were extremely heavy on the foot. To make matters worse, there weren’t even left and right distinctions in the pair! In 1892, American inventor Charles Goodyear developed a new process called vulcanization, which involved melting rubber and cloth together. By the early 20th century, small companies making things like bicycle tires started using this technique to make the earliest rubber-soled trainers. In 1916, Keds were introduced. While the makers of Keds hoped that “Keds” would become synonymous with this style of footwear, advertising agent Henry Nelson McKinney popularized the term “sneakers” instead, and that is the term that caught on. He derived that name from the fact that these shoes were lighter in weight than other shoes, and you could move around in them without making much sound. At the start, the market for these shoes was very small, specific niche. Needless to say, over the intervening 100 years, that market has exploded. As the name suggests, trainer shoes can be used for a variety of athletic training purposes. As general-use athletic shoes, they can withstand a variety of movements, from sudden stops and starts to jumping, cutting, and changing directions quickly. They are great for a plethora of workouts, and are a go-to choice for any visit to the gym. Hitting a high-intensity interval class? Showing up for a pre-dawn outdoor boot camp? Trainers provide a ton of comfort to take on the high impacts and acute stresses in these workouts. Weight training? Because of the excellent heel support in most trainers, there is less strain on the foot. Working on agility and movement? Trainers’ grooves and outsole patterns offer traction during multi-directional movements. Trainers can even handle short distances on the treadmill, although if your run is anything longer than a 5K, you should think about lacing up some running shoes instead; the difference in shock absorption can be significant. You can instantly figure whether a shoe is a training shoe by looking at how much flatter it is than other athletic shoes. The technical term for this is “heel drop,” referring to the difference between the heel height and toe height. And if you aren’t good at sizing up the heel drop of a shoe just by looking at it, ask someone at your favorite specialty shoe store to point out the differences. How Should a Good Trainer Shoe Fit? A pair of trainer shoes has to be comfortable. The upper and midsole should be quite flexible to allow for a multi-directional movement. The shoe should also have a lower heel drop, which will keep your feet closer to the ground and offer a firmer platform from which to pivot and push off easily. Lastly, a good training shoe has to be lightweight for efficient and easy movements. These days, training shoes are as much a fashion statement as an athletic accessory. Countless top brands are selling them to people who want to wear them casually on a regular basis. So, here are some quick styling tips that will make your trainers compliment your outfit fabulously. Trainers with jeans: Wearing trainers with jeans is quite common, but you must make sure that the length of your jeans ends at your ankle. Either hem them, cut them, or simply cuff them. Having your pants flow onto the shoe will take away all the attention they deserve. No socks (or at least hide them): While this may be tough, socks can completely destroy the look of trainers. So, if you aren’t comfortable not wearing socks, choose a pair that are well-hidden in the shoes. Pairing them with formals: Mixing trainers and formal wear might seem counter-intuitive, but it is surprisingly easy to pull off a fashion-forward look combining a suit and trainers. Like jeans, make sure your trousers end at your ankle. And be sure that your trousers and your blazer have a fit that works well with your body. A slimmer fit tends to look best with trainers. When it comes to the trainers themselves, be sure to choose a solid color that contrasts with the color of your suit. Ideally, plain white or black is a great choice. What Are the Differences Between Training Shoes and Running Shoes? 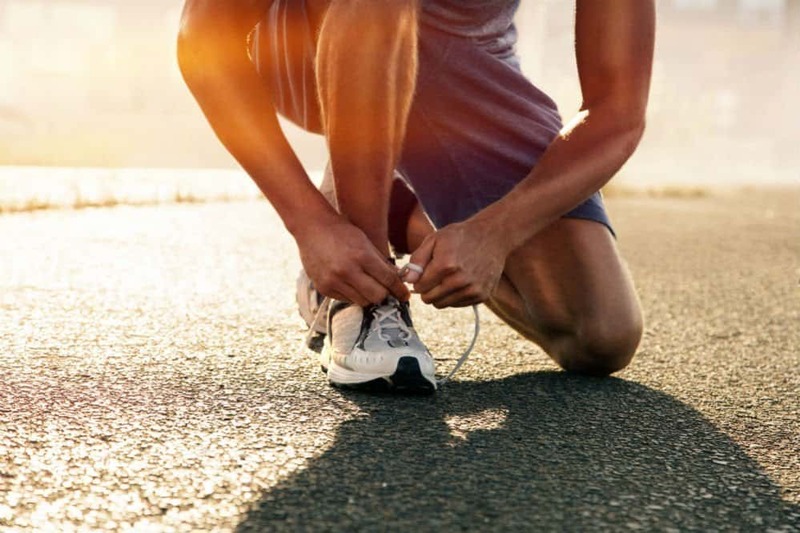 Since training shoes and running shoes look almost the same, it can be difficult to differentiate between the two. Nonetheless, there are some key differences, noticeably in the heel drop and flexibility of the soles. Running shoes are typically built for heel-to-toe movements. They typically have a higher heel drop, which comes from all the added cushioning and support that makes them ideal for running long distances. Structurally, they are made for forward movement, and put a premium on being light. The soles are not meant for dynamic side-to-side movement, but rather for efficiently rocking your foot from foot-strike to toe-off. Training shoes, as mentioned earlier, are meant for a wider range of activities, which includes multi-directional movement, especially side-to-side movement. Their flatter sole allows for more flexibility and a wider range of motion. They are more stable no matter what direction you are moving, and put a premium on support and flexibility over lightness and cushioning. Next time you are adding to your footwear lineup, trainers are a good, versatile choice. They are equally at home in the gym, on the street, out about on the social scene, and in the workplace. They look great whether you are wearing a track suit or a business suit. While they are a great pair of shoes for working out, you can totally make them a part of your daily wardrobe. It is in trend right now, and we are certain you will look great in them!